Working alongside companies such as Bentley, Aston Martin and McLaren, IM Kelly approached Omega Plastics as a Tier 2 supplier in early 2015 to work with them on a project for prestigious car manufacturer Aston Martin. The project consisted of nine components that together created the sun visors for Aston Martin’s DB11 – all of which required tooling and moulding. The main focus of the project was to understand the different finishes of each component – while some would be leathered, others would be chromed meaning the tool steel would need to be different in order for the components to have a certain gloss finish. For that reason, both P20 and Stavax steels were used in the manufacturing of the tools – dependant on the required finish of the component. Material selection for each component was carefully considered due to the nature of the project and the component environment. Through testing, the final components were moulded using alternative grades of Polycarbonate ABS – a material to withstand the potential, extreme weather climates and automotive environment testing. Through a relationship with a local supplier, all relevant components were chromed to specification – giving the components that high-class and superior finish that Aston Martin are renowned for, before being leathered by IM Kelly using the highest quality of natural leather. 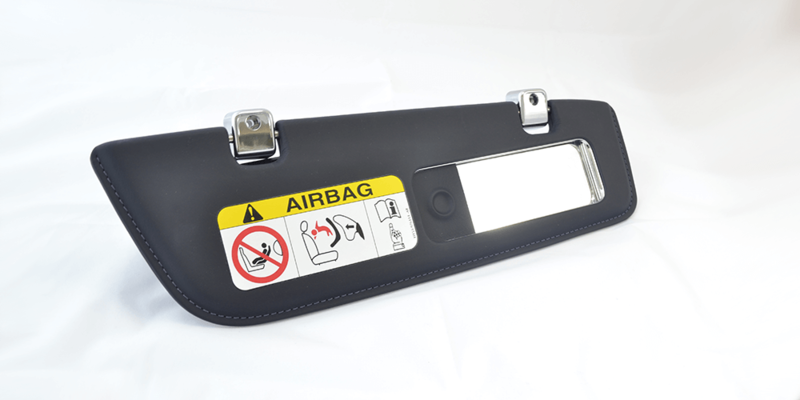 The sun visor project continues to be ongoing as Aston Martin plan to roll out the project into upcoming models due to the high-quality and professional service provided by IM Kelly. Learn more about the professional finishes we can provide for your project.